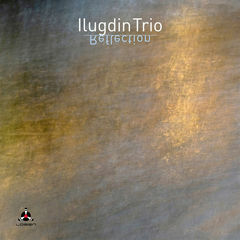 Pianist Dmitry Llugdin is very clear about the direction he and his trio are moving towards. He writes: Reflection, the title track, shows the style I gravitate to in a most vivid way, a style where composition has the priority. It's more refined [than the trio's former album] in respect of form, and more separated from mainstream jazz. There is indeed a classical music feel to these highly evocative pieces. The music is descriptively conceived, with flowing rhythms and elegantly stated themes. Transformability opens with a lively statement in 5/4 time and graduates to sections in 11/4 adequately displaying the technical mastery and emotional input of these superb musicians. There is a tantalisingly 'slow motion' coda which describes the piece's harmonic structure. Dmitry: It is an allegoric idea of time, brevity, eternity, and one's place in relation to the Universe. In fact, the whole album invites us to appreciate the inner workings of the trio's mindset or 'groupthink'. Nocturne (evocative of the night) is a lovingly crafted composition; calming and sonorously sumptuous. The choice of C# major as the home key further lends a classical tone to the piece. Prelude #4 also employs classical devices with its pivotal 3-chord motif and Victor Shestak's delightful descending bass lines. There is telepathy and empathy in this band and they communicate effortlessly. Petr Ivshin, who plays magnificently throughout the album, opens Old Town with muted drums that set the tone for yet another melodically and harmonically rich composition with yet another tremendous solo from Dmitry, person and piano - as one. Dmitry: This is a very illustrative tune, depicting Jerusalem, a place that I love very much. Aura, in 7/4 time (apart from the coda in 4/4) is a bright entity with ostinato bass and left hand piano riffs, developing into a section of pure swinging jazz before returning to the profoundly punctuated theme.